David Knight: Did cold-hearted council melt and move fridge-freezer dumped in no-man’s land? I have had my eye on a fridge-freezer for a few weeks. These days we are spoiled for choice, don’t you think? My mind was set on one in particular. This fridge-freezer was abandoned nearly four weeks ago in a narrow lane around the corner and we – that is my neighbours, various members of the visiting public and me – had to manoeuvre around it every day. It looked like a classic case of flytipping. I am not absolutely certain but as it was standing upright or knocked flat on its side for days on end makes it highly suspicious. Overflowing food and household debris are a plague in many neighbourhoods where refuse collections are being squeezed and reduced. Then we have to factor in unlawful dross from the selfish bloody-minded brigade. People seem to fall into one of two categories. This is a good test: you either think nothing of parking on double-yellow lines with emergency warning lights flashing just to buy a kebab or packet of cigarettes, or you park safely and walk. I live in what is supposed to be a historical conservation area, but it often feels like an annexe of Aberdeen University on some streets, with wall-to-wall student flats. The council has been complicit in taking the soul out of the place and this huge transient group does little for community spirit. Sad old fridges worn out before their time under the weight of student booze have a short lifespan around here. This blot on the landscape was a bigger mountain to climb than I thought. We imagined the council would move it in a jiffy, but relations began icing over. It was not just the fridge-freezer getting in the way, there were legal and moral obstacles I had not foreseen. I blinked hard to make sure I wasn’t dreaming as someone at the council contact centre explained that if it was a case of flytipping it was up to residents to foot the bill for collection, or transport it to a tip ourselves. It transpired that a boundary might have been crossed in more ways than one. It is one of those side-street private access lanes which nobody appears to own, and the fridge was abandoned about 72 inches from a busy public highway – a technicality which allowed the council to wash its hands of the whole thing. She said they wouldn’t touch it. It’s private, you see, not council. It did not cut any ice that the fridge-freezer was a significant obstacle in a lane which also happened to be used frequently by the public after the council turned it into an official parking zone due to expansion by – you’ve guessed it – the university. Even community wardens had to walk around the fridge-freezer to check parked cars. The fridge escaped a ticket, though. The irony is that the council’s own bin lorries had to try manoeuvring around it every week to make normal collections in the lane. You can’t make this kind of stuff up. I assume you are familiar with Catch 22? What is all the fuss about, you might ask? Why not just move it to a tip yourself? Maybe you are right. Press and Journal Deputy Editor David Knight. As for the bigger picture, public nuisance from unauthorised waste is being played out across our entire region every day as councils lost the battle long ago. As The Press and Journal reported recently, there were only 35 convictions in 15 years for flytipping across the north and north-east. It is an astonishing, embarrassing figure which speaks volumes about the lack of effort being displayed. There are countless complaints. 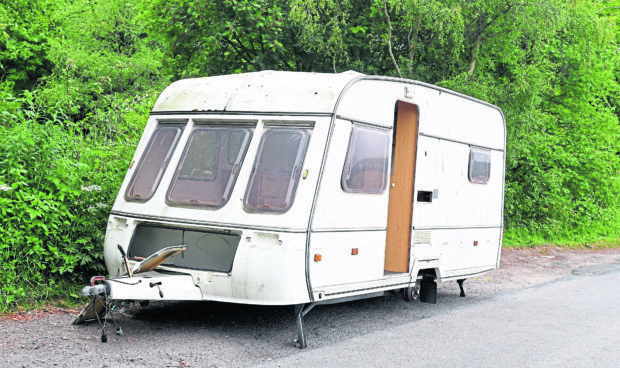 In Aberdeen, a family was frightened to let their children play outside due to illegal refuse dumping, and another problem site was so lawless that even a touring caravan had been abandoned. These are just the tip of the iceberg. Meanwhile, the Scottish Government’s website is very clear about the potential dangers to the environment through chemicals leaking from old fridge-freezers which are not disposed of correctly. The government also warns about the threat to young children or animals being trapped in appliances, but makes no distinction between private or council land which is side-by-side without a visible boundary. However, it seems the solution often depends on the goodwill of residents who are saddled with the mess. “What would happen if the fridge-freezer was moved mysteriously into the public highway a few inches away, making the council responsible for uplifting it?” I asked the council call centre. Ah, that would be a flytipping, which is a criminal offence, came the reply. I was reminded somewhat ominously that our call was being recorded. Now I was worried I might be a potential prime suspect in any forthcoming council “fridge-gate” investigation, if person or persons unknown “re-dumped” it. Now for some dramatic breaking news. The fridge-freezer melted away a couple of days ago. It vanished in broad daylight. I’m flummoxed. Maybe the council had a change of heart – in which case, a victory for common sense over the rule book. Maybe its former owner or other residents came to the rescue. Maybe it was re-dumped. If the latter was the case, I want to place on record now that I have a cast-iron alibi.